I don’t know why I’m always drawing faces. This was done with Photoshop. I created the background texture, but then instead of drawing on a separate layer, I drew on the background layer. 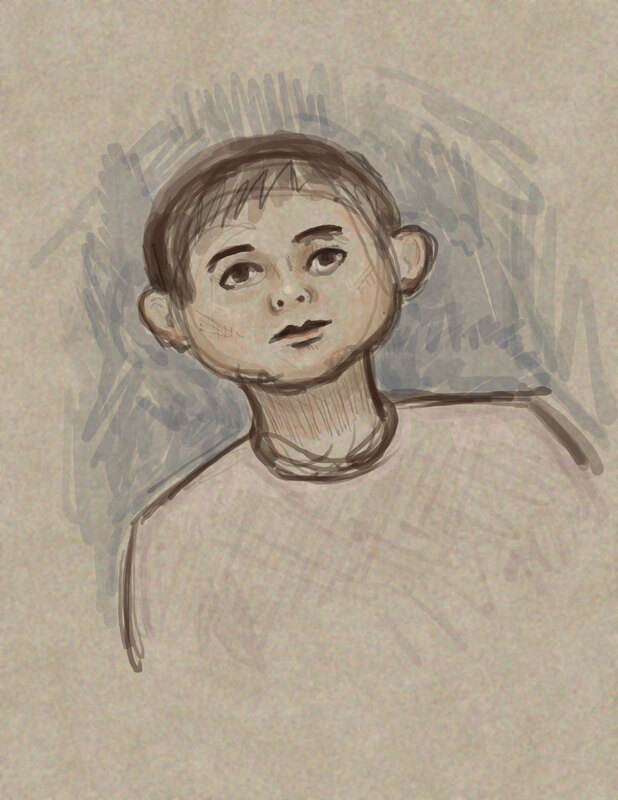 After drawing the first few lines of the face, I couldn’t clean it up by erasing them because it erased the background. Ooops. The other day, I wrote about ripping my vinyl records and Noel said that he was interested in getting a turntable. The vinyl revival hasn’t escaped me, although it has puzzled me a bit. A compact disc revival I could actually understand. It did get me thinking to how these things change and that most alternatives have both pros and cons. One thing that I believe has more cons than pros for many people is the laptop, as contrasted with the desktop. The main advantage of the laptop is that it is portable. Beyond that, I think they’re terrible. I have both a laptop and a desktop and I almost never use the laptop when I’m not traveling. I couldn’t imagine have that as my only machine. Almost everything I use a computer for I can do faster and better on my desktop. I can type more quickly. Editing photos is easier. I simply don’t do any graphics at all on the laptop. Plus, laptops are usually far worse for your posture. It’s much easier to find a comfortable position while using a desktop. The screen on a laptop is almost always too small. I was surprised one day by someone saying that it was great to see their photos on a television because the screen was so big. For a moment, I was puzzled and then I recalled that many people have laptops. My own screen is so big that I’m pretty comfortable backing my chair up a few inches and watching a video, and it’s my favorite way to view photos. I suspect these days people often choose a laptop without giving a desktop much thought. When my mother’s last computer finally died, her friends said, “Just go to the store and buy a laptop,” usually naming a particular line by a specific manufacturer. Instead, I built a desktop for her. I would really encourage people, especially young people who may have never used a desktop at home, to try one. If you do so, I’d also encourage you to build it yourself if you are so inclined. If you haven’t done it, it’s probably much easier than you think. Plus, it’s a lot of fun. Lady Ada at this point suggest some uses like gaming or engineering. Mershad adds graphics, which only confirms that he really does know his market. As an artist, I know that some of the most processor demanding tasks are involved in producing graphics. For some reason, it doesn’t cross people’s minds as readily as gaming does. Ironically, programming is one of the least demanding tasks, unless you need to test a program which is itself demanding of processor power. One of the reasons I built my own computer was that I wanted a beast of a graphics machine. Hence the great big screen. I keep threatening to buy a second one for a dual monitor set-up. You probably won’t save a whole lot of money building it yourself, but since you’re getting exactly what you want it will be a better value. Here’s the whole interview. I actually thought it was pretty interesting. Also, a fun thing to look up is to look for images of computer case mods. …out on parole? …still on the dole? …a mole in a hole? Have you ever had the feeling that you were glamorous beyond your means? That deep down inside there was a fabulous person just screaming to get out… and the key was something bright and shiny? But every morning the alarm clock rings and pulls you from your glitter filled dreams. You plod down the hallway and are confronted by irrefutable evidence that you are not a star. What a rude awakening. I try not to complain about my apartment… but the flesh is weak… or maybe it’s the will. I don’t know. The neighborhood is great. But my apartment… let’s just say that I’m not a star. What a drag. Okay, my bathroom. For starters, the entire apartment was painted badly, huge drips all over the woodwork, the lights and the tiles in the bathroom. I don’t even know how someone does this. It looks harder to make this much of a mess than to do it neatly. When I first moved in, I cleaned some of it up, but I eventually got tired of ruining my nails, and I don’t even have long nails. However, I never got around to doing much of anything in the bathroom. The bathroom has marble tiles on the floor and around the tub, which has a shower in it. 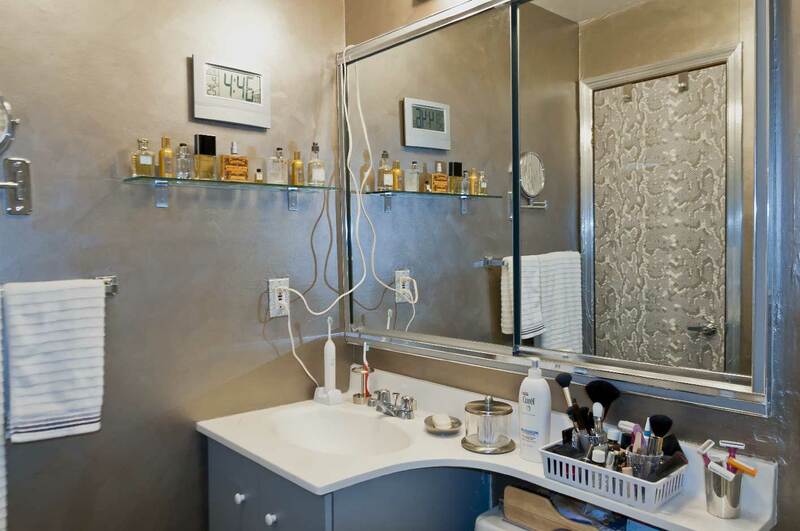 However, there is no place to put a shower curtain rod. I got one of those tension rods, but it kept falling down. Have you ever been in the middle of taking a shower and had your hair all shampooed up and had the curtain rod fall down. Water is spraying all over the bathroom, you try to pick up the rod. You bend over and soap is now going in your eyes. You don’t know what to do, so you turn off the water and finish bathing sitting in the tub, cupping your hands trying to pour water over your head to get the shampoo out. Darlings, this is not how a star wants to start her morning. Finally, I said to myself, we’re going to fix this! But what to do about the curtain rod. You see, I’m a renter and I don’t think it would be okay to start drilling holes in the tiles. I don’t worry too much about the walls, because that can always be put back, but landlords get mad about changing things you can’t reverse. Which also brings me to the door. The door is wooden and has never been painted, unless you count those big drips. Frankly, they are average hollow core plywood doors and I would paint them, but as I said I rent. Also, the woodwork is of low quality wood and I’d paint that, too. Plus, add to all that, there’s a spot on the wall next to the tub that was all mucky because the previous tenants apparently took no care about whether or not they were splashing the walls – or maybe they just decided to shower without a curtain. I’ve been tempted myself. The sloppy painter made an attempt to fix it, but hadn’t primed the area and now, on top of looking like a lumpy mess, the paint was peeling. Lastly, the water pressure is highly unpredictable. Sometimes, it’s low and then I would have to angle the shower head towards the back of the tub. The next time, I’d turn on the water and the pressure would be higher and the water would hit the wall and spray all over the place, mainly on that mucky spot. So, it started with the shower rod. I said to myself, there must be a solution. I toyed with a few different ideas, including suspending a curtain from the ceiling. Finally, I decided to use pipe fittings to make a rod that I could attach to the wall where the tile ended and which would sort of cantilever over the tub. 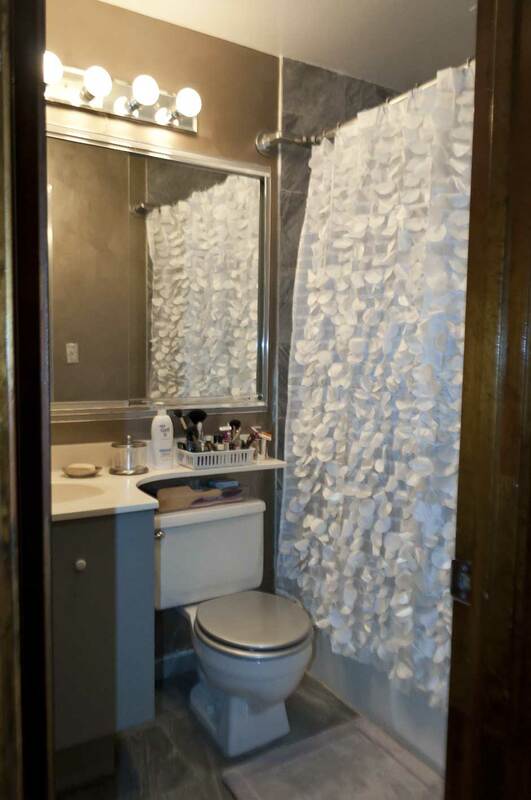 While I was at it, I decided I might as well give the bathroom an entire makeover. My sister came up to help. We had just set about working when it occurred to me that I should take some before pictures. My sister took a couple with her phone. As you can see, “dingy” would be just the right word to describe it. You can see the unreliable tension rod. Below is another angle. We already took the towel rod down, but you can see it’s just sad. The purple was from the bathroom in my previous apartment. There was paint on the light fixture, the towel rod, the door and the toilet paper holder, but there was not paint over the spackle* filling holes where a previous tenant had hung something. Go figure. But it didn’t matter at this point because we were going to fix all that, or at least try. Now, my own theory of decorating is if you can’t make it elegant then you should have fun! In the past, I’ve had a bubblegum pink kitchen and a high gloss black bathroom. This time, I decided to paint the walls with a metallic paint. We also painted the ceiling with a high gloss white. The paint on the tiles was already there. The pipe fittings are from Simplified Building. After I ordered them I noticed that they have fittings for ADA (Americans with Disabilities Act) compliant hand rails which fit inside the pipe to make a smoother transition on a hand rail. In retrospect, that might have been a better choice. Still, this works, and is certainly an improvement over the rod that kept falling down. 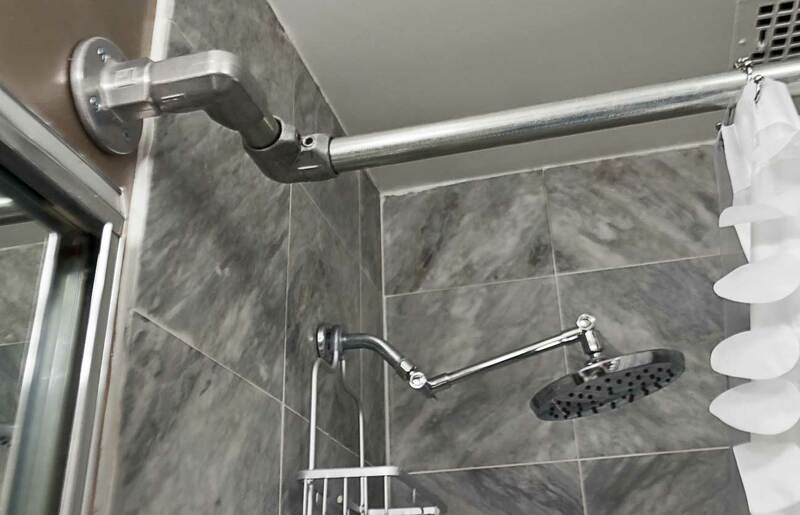 Behind it, you can see that I installed a shower head that has an extension arm. I’m hoping this will help a little with the problem of angling the shower head as the water pressure changes. I haven’t used it enough to know if it’s a great solution, but so far it seems to be fine. 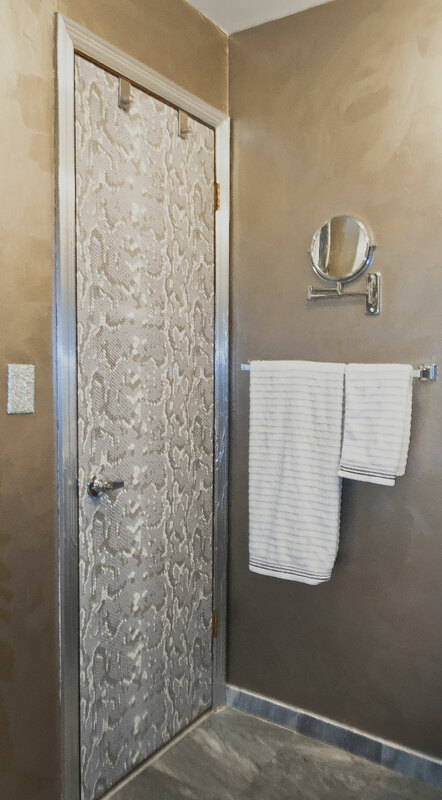 It’s hard to see in the photo that the walls are in fact metallic, but they are. The color is called “nickel” and is warmer than silver but not as dark or as warm as bronze. I also got a new shower curtain. I would have gotten a sparkly or shiny one if there had been one in the store. Here’s another angle. In the mirror, you can see what happened to the door. 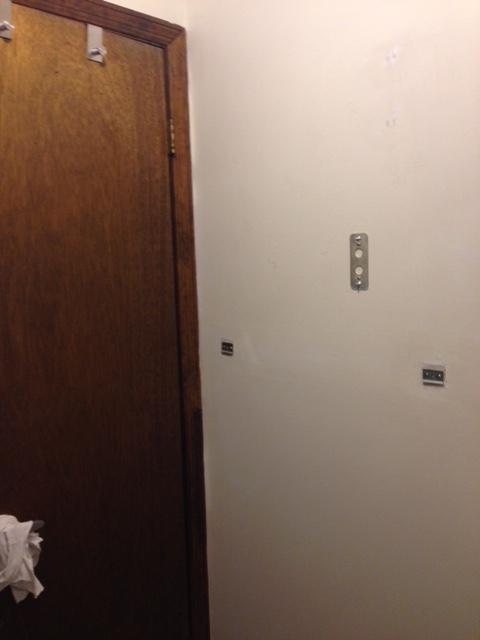 We covered the door and the door jamb casing with adhesive shelf liner. I’m hoping that it stays in place long enough to at least have been worth the effort to put it on. I’d been puzzling for sometime about what to do with the ugly door. 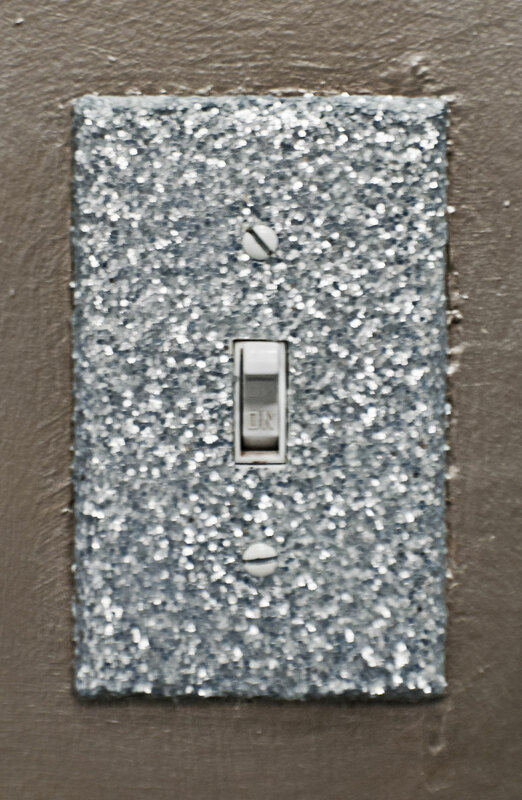 Finally, the light switch cover. It was a cheap plastic one which, like everything else, had blobs of paint on it. I roughed it up with some sand paper, coated it with glue and dipped it in glitter. When that was dry, I put a couple of coats of varnish on it. I’m not sure how long that will hold up either. 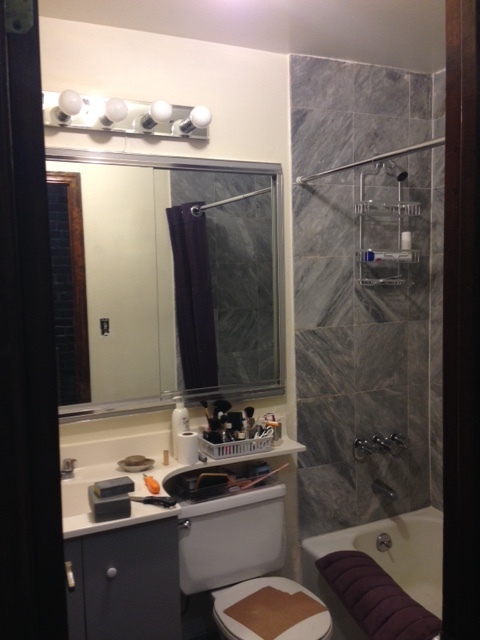 All in all, I’m pretty pleased with my budget bathroom makeover given the constraints of being a renter. I saw news of Prince’s death today. And it put me in mind of a brief episode that wouldn’t make it into a “memoir” if I was writing it as a book in the normal way rather then recounting episodes as I remember them. I’ve been putting off writing about anything that happened during the last couple of years of high school because my family moved and that introduces a whole new group of people and a new environment. My new school was very different from my previous school, which was different from the one before that. The town was bigger. It was also richer. People refer to the town as “diverse,” but in some ways it was the least diverse, unless you’re talking about skin tone, which is of course what most people mean when they say “diverse.” That, however, is a tirade for another day. There were some distinct advantages to going to a larger school. We had all sorts of enrichment classes available with didn’t exist in my other school. Instead of gym, you could take ballet or modern dance. There was a variety of music classes, as well as drama, set design. There was a larger choice of languages. There wasn’t just “art class,” either. They were more specific, including, believe it or not, a weaving class. It wasn’t really a “basket weaving” class, since we wove other things as well. For some reason, there were no boys in the class and the class was really small. Most of the girls in the class were not in my other classes and none were in my larger social circle, so it had the feeling of being a little respite from the larger track of my life. A couple of days a week, I’d head to the art room which was located at the end of a hall where I had no other classes and never otherwise went. We all sat around a table in the back of the room. It was even physically isolated. With so few students, there was no real need for the teacher to keep order and she allowed us to bring in a boom box and play music. It was just a really nice pleasant environment. The was one girl I remember quite well. I can still conjure up her face in my memory. She was a petite, pretty girl with dark skin and delicate features. She was soft-spoken and gave the overall impression of being gentle and dainty. Sometimes, there are people about whom, after that part of your life has passed, you think, “I should have reached out more.” I liked her and she was always friendly to me, but we never became friends for the uninteresting reason that our social circles did not overlap. She was not in any other classes with me that year, but the next year she would be in my history class. Otherwise, I rarely saw her. Like me, she was relatively new to the school, but unlike me she came from much further away. Her father, was an executive with a large international corporation and her family had been living in Kenya. I believe they were all American, but it was so long ago I can’t be certain if I knew that for a fact or it was something I just assumed. And that was the first time I heard Prince. Boy! Do I Feel Dumb! Needless to say, I’m incredibly excited about my upcoming trip to China. A few years ago, there was a student at my mother’s school who had recently arrived from China at about the age of fourteen. My mother tutored him in English and sort of took him under her wing. Now, we are invited to his wedding. I’ve never been anywhere in Asia before, let alone China. So, in preparation for the trip, I got one of those language learning programs and I’ve been doing a little bit everyday. 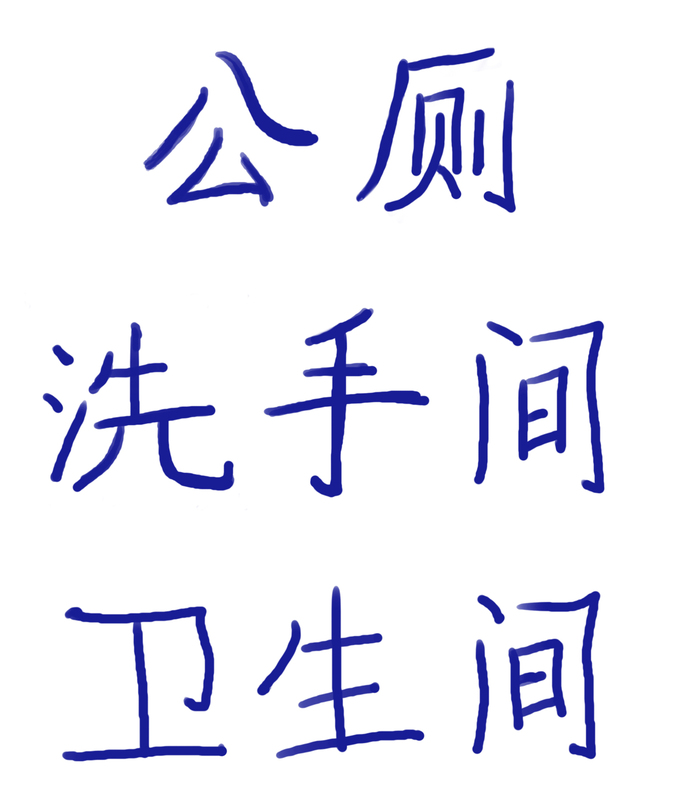 I don’t expect much, really, but since I don’t know a word of Chinese, I figured anything is better than nothing. In Europe, if I’m in a place with a language that’s either Germanic or Romance, even if I don’t really know the language, I can take a guess. At minimum, I can read street signs. I’m a little bit apprehensive about China, though. A website I found suggest that these are some useful words to recognize. Supposedly, these say toilet. If not, do let me know. The language learning program is done entirely in the target language. It shows pictures and words and you hear a recording of voice. You have to match the picture to the words. Sometimes, however, the meaning of the picture is unclear. Sometimes, it feels like you’re picking it up quickly. Other times, however, when the picture is confusing, I feel like a total moron. I click and click and get a big orange x and a sad sound. Beneath the photos of the people in France, however, there were another set of three photos that were highly mysterious for me, and I kept getting the question wrong. One photo, is of a woman wearing a cowboy hat. The caption for this says, “tā shì cóng měi guó lái de.” Great. Comparing it to the French photos about, I’ve got the idea that this woman is from some country, the name of which we have not yet learned. Obviously the point of this screen. Hmm. Cowboy hat. What country is that? Argentina, perhaps? Another picture, however, has a baseball player. Do they like baseball in Argentina? It certainly wasn’t an association of mine. Maybe it’s Cuba. But they don’t really have cowboys in Cuba? Uruguay? Do they like baseball in Uruguay? They play baseball and have cowboys in Mexico, but there’s that third picture. It’s a picture of some little girls in colorful costumes. They’re wearing shirts with a blue square with white stars on it and red and white stripes on the rest of the shirt. They have little flags and pinwheels and look like they could be at a party or a parade. Cowboys. Baseball players. 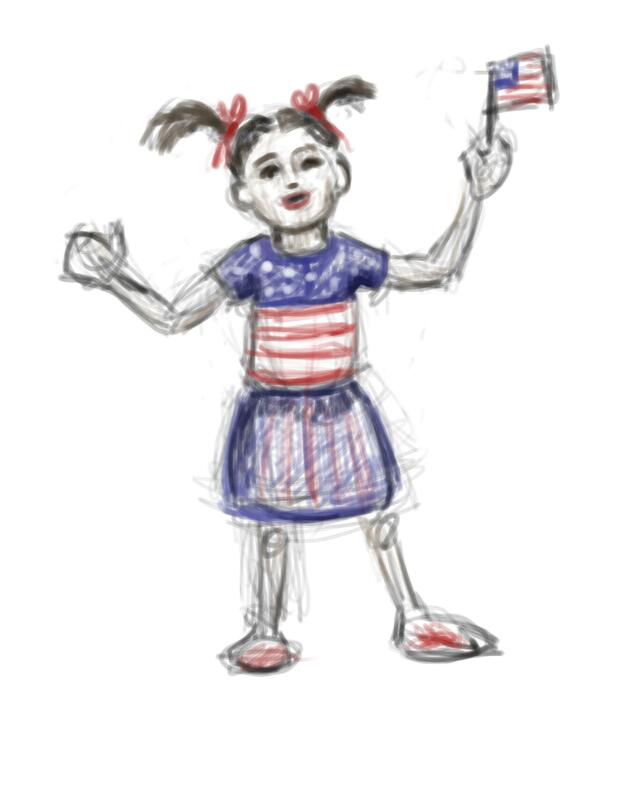 Little girls in red, white and blue outfits with stars and stripes. Where could these people be? I was staring at the photos racking my brain. Are these people all from the same place? Where could the be? When I finally figured it out, I felt so stupid. I laughed out loud at my self. Where on earth could she be from? Regarding my organizing – I haven’t scanned most of my old photos. Just a couple that looked as if they might crumble. Otherwise, I’ve just put them in boxes according to year. I also have a box of old slides. Those are totally disorganized, but that will have to wait for another day. However, I came across a small photo frame. Part of my organizing has been to either use something or get rid of it. For those who worry about waste, you can relax. Nothing is going in the garbage. If it’s still in good shape I’m either giving it to someone who wants it or putting it in a garage sale my mother’s neighbor is having in a week or two. Still, it can’t stay in my place because I’m too messy to hold onto little things I don’t use. So, I figured I had to either put something in the frame or get rid of it. 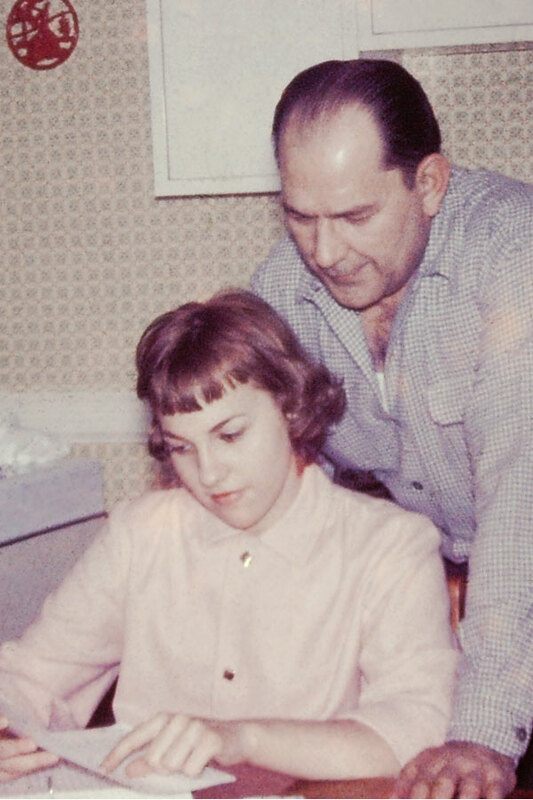 I searched through the slides looking for one of my parents as teenagers. 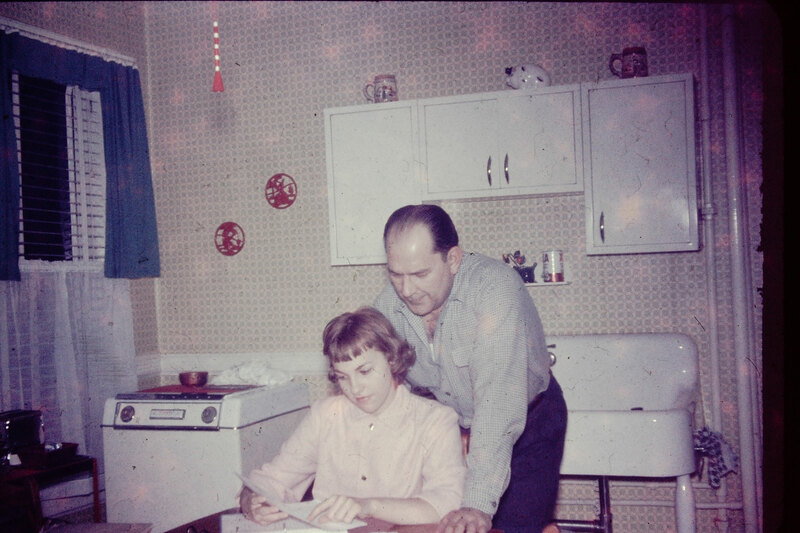 Instead, I found one of my mother and grandfather which I thought looked nice. Since the frame is small I cropped it. Here’s the original, which shows the whole kitchen. You can see that I cleaned up the dust. My mother saw it the other day. She said, “My father used to help me with my math homework. He never finished high school, but he could help me with classes he never took.” My grandfather had an abusive step-mother and he ran away from home as a teenager. A couple of weeks ago, I said I might take a blogging break. Originally, I said that because the rise of the “regressive left” has left me in something of a quandary politically. But while I was writing that post, I got a phone call from a bill collector, which sent me into a tizzy. As I mentioned at the time, it wasn’t a money issue, but a disorganization problem. One of the many things I’ve been meaning to do but have been putting off is addressing the matter of how I listen to music. At this juncture, I have vinyl LPs, compact cassettes, CDs, and some digital formats, mostly from Apple’s iTunes. I haven’t yet subscribed to any of the streaming services. I tried the free version of Pandora on three separate occasions, at least year apart, and I hated it each time. I don’t know how their algorithm works, but I’ve never been much of a genre person and my taste is pretty eclectic, so maybe I’m not a good match for that type of service. In any case, my music situation is a mess. About a year ago, in an effort to get my music situation, for lack of a better word, rationalized, I made an HTPC, a “home theater personal computer.” I have little interest in the movie or gaming aspect of the device. Mostly, I wanted an easy way to listen to music. The good news is that since you don’t need a lot of processing power, it’s not a particularly expensive type of computer to build. Further more, you can install Linux as an operating system and I installed a media center program called Kodi. Both of those are free. There are a few other free options. (Considering a post I saw recently, I’ll add that the Kodi software is free. You can use it to listen to some of the streaming services, but you have to pay for the subscriptions for that.) Then I ripped my CDs. Then I looked at my vinyl. I sighed. I put it off for another day. Meanwhile, the old stereo set up gave up the ghost, so I couldn’t listen to the vinyl or the cassettes anymore at all. I unplugged it. I wheeled it into a corner, with honest intentions of getting to it a soon as I had a little time. There, it gathered dust for almost a year. I’ve rarely listened to the music purchased from Apple except when I’ve been exercising. That has to do with the iPod device. For a while, I had an iPod doc, but it was too inconvenient and I rarely used it. My brother in law had given me his because he didn’t get much use out of it and thought I might use it more. It was a nice gesture. He now has it back. My boyfriend and a few other people gave me the distinct impression that I was not an “audiophile.” I cared enough to handle the records by their edges and put them back in their sleeves when they were done. I had good enough ears to know that my own cheap turntable with an integrated amplifier which hooked directly to the speakers sounded pretty bad. Still, it was a million times better than the quality of listening to music using an iPod. he described a “feedback loop” where producers, artists and engineers make their way through the studio process to release an album, and how they later hear it in the real world influences the way they’ll make their next album. That’s the way it worked in the 1950s, with LPs and singles, which were heard at home on a hi-fi and on the radio, so the engineers made recordings that sounded best at home and on the radio. That initially held true with CDs, but now that most people experience music away from home, in noisy environments, on lossy streaming services like Spotify, all of that informs the way producers, artists, and engineers approach their next recording. Silverman believes that the way today’s pop music is arranged, designed and performed is strongly influenced by the quest for extreme loudness and limited dynamic range required for music listened to on-the-go with tablets, ear buds and phones. It’s one thing to hear the sound in the studio, but the music will mostly be “consumed” as background filler. It’s rarely the prime focus anymore. The last sentence jumped out at me. I’ve never really enjoyed music as “background filler,” it’s too distracting for anything except activities that are boring due to their lack of cognitive stimulation, like exercising or cleaning. Still, the slogan, like the comment that music is no longer the prime focus, said something about how things had changed. I don’t want to fall into the trap of nostalgia. I like technology and would be perfectly happy for a newer and better way of doing things. I don’t yearn for the “warm” sound of analog or think that the pops on a vinyl record add character. Yet there’s something odd about “making” music social. As an art form, music predates recorded history and it has always been social. It’s only been a little over a decade, with the emergence of the iPod as the dominant form of music playback, that music has ceased to be social. It’s strange to think that the very young adults of today have had a significantly different experience of music than almost everyone else, lets say people over thirty or thirty-five. When the Sony Walkman portable cassette player first came out, older people complained that people who used them were anti-social. However, although they became very common over time, they never became the dominant form of playback. They were always ancillary to other methods. This was probably due to the fact that the media, the compact cassette, could be used in both home stereos, since those usually included a cassette deck, and car stereos, which is why I own so many cassettes. Going back to my teenage years, I mostly found out about new music from two sources, the radio and my peers. For those young enough to not know, radio stations at the time were intensely local. The individual deejays had a fair amount of discretion about what they played. When someone would by a new record album, it wouldn’t be at all unusual to invite friends over with the very specific intent of listening to it. Now, I don’t want to make it sound as if you couldn’t say a word while the record was playing, but the recording remained the focus. My taste in music expanded as I got to know other people who had been exposed to other things. Which brings me the reasons I’m going to all the trouble to rip my vinyl. My sister suggested that I just repurchase much of it. One reason is simply that some songs that I listen to only occasionally will be budgeted out. I have two Johnny Cash records. I’m pretty sure if I were to repurchase any Johnny Cash songs, it will be only two or three. Same for Joe Cocker, Sonic Youth, Al Green, The Supremes, Santana, really just about every record except the Rolling Stones’ “Some Girls.” Some of these, especially in cases where my favorite song has too many pops and scratches to be listenable, I will in all likelihood do just that. Another reason has to do with my own sense of personal history. Years ago, record albums were a fairly common gift. Their size and shape were a dead give-away under the Christmas tree. I can remember who gave me what and when. Furthermore, I have records that I inherited from my grandfather when he died and others that had belonged to my father. I probably wouldn’t buy many of those again, although I do occasionally listen to them. They just wouldn’t be prioritized. In fact, if I got rid of the physical records, I might literally forget them. Even when I bought the record myself, I can remember sometimes who introduced me to it. I remember going with my mother when she visited a friend who had a daughter my age. We went down to the basement where she had a stereo and that was the first time I heard Steely Dan’s “Aja,” which had only just come out and hadn’t yet gotten much airplay. Then there are also the things that can’t be purchased again. A flexidisc from a comic book. A few things from unsigned bands, though most of those are either on cassettes or CDs. Hawking cassettes with four songs was a really common thing after performances. Do bands still do anything like that? Download from our website when you get home? I’d probably forget. All of these things make up, for lack of a better word, what I think of as my “taste.” I might supplement this with a music streaming service that has a larger library than one person could ever own, yet there is something impersonal about that. The fact that you can’t personally own everything forces you to make a judgment. I finally seem to have everything set up, and am having the interesting experience of listening to every record album I own while making a digital copy. If I understand the laws correctly, I’m allowed to make a copy for my own use. Still, it’s been quite an effort, especially if you consider the searching the internet for possible ways of doing it. My sister tells me that my brother-in-law these days mainly listens to music with his laptop on his lap from the built-in speakers. It’s hard to blame him. The other day, while I was trying to put my current set-up together and was running into some serious snags. The first was simply being unable to update the Kodi program because I had forgotten the password. My serious disorganization meant that I had no clue where I might have put it. Surely it was lying on a slip of paper somewhere. There’s a pile of slips of papers with cryptic writings on them which appear to be passwords to unknown things. I tried all of them and none worked. Finally, I decided the only remedy was to reinstall the entire thing. The initial install a year ago went very smoothly. Unfortunately, that wasn’t the case this time. I won’t bore you with all the things that didn’t work. All small. All solvable. However, the sheer number, as well as the sore feet I was getting from standing in front of the HTPC and the annoyance of walking back and forth between computers, well, I sort of wound up in a ball on the floor crying. I couldn’t help feeling that what I wanted was so simple. I just wanted to listen to music in a way similar to the way I had for most of my life before iTunes. Why did it have to be so hard? How ironic, just as I was writing that, I smelled my potato and chicken soup burning on the stove. A sign to wrap this up.